La Atalaya, 1 abril 1972, p. 197. La Atalaya, 15 feb. 1981, p. 19. La Atalaya, 1 jun. 1952, p. 24. La Atalaya, 15 feb. 1979, p. 30. 5. La Atalaya , 15 mayo 1963, p. 307. Reasoning from the Scriptures, 1985, p. 306. ¡Despertad!, 22 jul. 1973, p. 4. 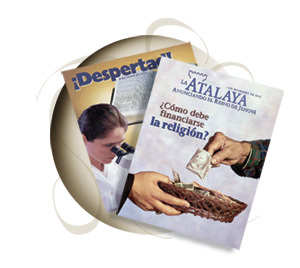 8- Jesús fue resucitado "no como una criatura humana, sino como un espíritu"
Let God be True, p. 276. Reasoning from the Scriptures, 1985, pp. 89-90. The Truth Shall Make You Free, p. 300. Let God be True, p. 101-100. Reasoning from the Scriptures, 1985, pp. 406-407. Studies in the Scriptures, Vol. 1, pp.150, 152. Let God be True, p. 59, 60, 67. Let God be True, p. 79, 80. Reasoning from the Scriptures, 1985, pp. 166- 167, 361; Let God be True, p. 121. Reasoning from the Scriptures, 1985, pp. 72-73. Reasoning from the Scriptures, 1985, pp. 90-92. Studies in the Scriptures, Vol. 1, p. 150,152. Reasoning from the Scriptures, 1985, pp. 358-359. 21- También se rehúsan a votar, saludar la bandera, cantar el himno nacional y a celebrar la Navidad o los cumpleaños. No se les permite servir en las fuerzas armadas.